Bring back the interactive map, please! There are a few sites that, to a genealogist, are simply indispensable. If The Legal Genealogist absolutely had to, I could live without some of the sites that are in my genealogy toolbar, or my key bookmarks list. But very high on the list of sites I can not do without is the interactive map of historical county boundaries at Chicago’s Newberry Library. Well, you could do all those things, that is… until now. 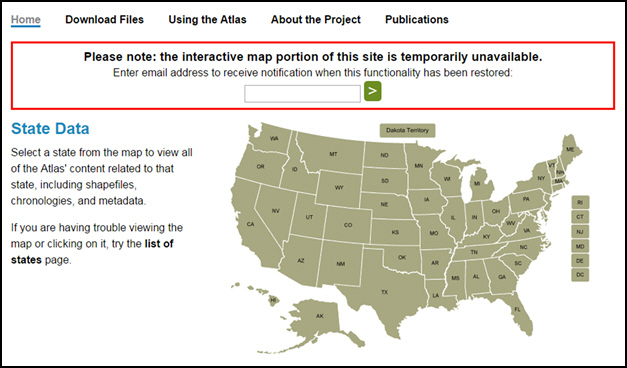 As you can see, right now, if you go to the Newberry Library website and go to the Atlas of Historical County Boundaries page, you get a message right at the top. One that makes my heart stop dead in its tracks. Now any time you see a message like this, you know that the most likely situation is that there’s some sort of technical glitch that will take some serious resources to fix… and that those serious resources won’t be committed unless and until the site has evidence that the missing functionality is important to the site’s users. In other words, if we don’t tell the Newberry Library that we really really want and need this functionality back, we may well lose it forever. So you know what we need to do, right? Just added my email. This is one of the most useful tools in my toolbox. Re: The Dear Newberry matps. I didn’t know about them. I temporarily can’t get on Heritage Quest through my library because the library has an IP issue. But maybe? One of your LONG time fans. Why not use the online version of Ani Map? The North Carolina page is found at http://www.usgennet.org/usa/nc/state2/amap/nccf.html . I rely on these formation maps quite extensively. For generations, some of my ancestors moved several times in their lifetimes, usually to other states. Or an entire generation (or 2 or 3) would move almost en masse from one geographical region to another, usually staying in general proximity to one another, though often in different states. It keeps the confusion down when I can go to one location to figure out the right reference for where they are at a given time, and track them from location to location. The Newberry is my go-to for this sort of thing. And I hope it will continue to be. I added my email as well. Added my email address. This has been a wonderful resource for my research. Thanks for alerting us to the issue. I left my email as well. This afternoon, I received a nice response from Digital Initiatives and Services, promising to keep me updated, and reminding me of the other Atlas features which are still available, including the downloadable shape files for those of us who use GIS software or Google Earth. So DIS is listening. I’ll be there Sunday for the annual book fair. I’ll see if they have any updates! Great news (via Thomas MacEntee at Geneabloggers, shared in his Genealogy Do-Over group on Facebook) — the interactive maps are back!